Part II of the Jerk Belly of pork, AT LAST!! I woke up on Sunday morning like a kid on Christmas morning; I planned my day around this piece of meat, what was to be cooked to accompany it, and waited for the appropriate time to switch the oven on! All that was going through my head was that silly saying from the Dolmio advert… “Today is the day!” and a great day it was! Now my relationship with pork has been a little strained, it has never occurred to me to stop eating it and I don’t see why I should stop. I mean, can you imagine life without pork? Wouldn’t be able to enjoy all you can eat ribs at The Spur (Nairobi), or the amazing pulled pork at Bodean’s (London) not even Farmer’s Choice spicy sausages. My knees are weak just thinking about it! But as it turns out, my Jamaican doesn’t eat pork, and has a big problem with me eating it. His reasons by the way are rather suspect, I’m not sure I understand them at all. So you can imagine how my obsessing about porky may have been a bit of an issue. I think I will have to be a pork lover on the d-low! Back to my swine! I decided to serve the swine with sweet potato, and found this great recipe in Jamie at Home cookbook- sweet potato with cumin and chilli, and marinated Romano peppers from the Ottolenghi cookbook. It did seem like a strange mix, but I think it worked quite well with the pork! I also made a non-meat option for my non swine eating friend Miss Y-vo, a salmon & potato empanada adapted from the Ortega’s Book of Tapas. I’ll post the recipes. For the pork, I put it in the oven for about 3hours. But it really depends on how big the piece of meat is. Be sure to check on it though, it could dry out, so baste it regularly. I got carried away chatting with the girls, I let mine dry out a little, so be careful when the stories get too juicy! 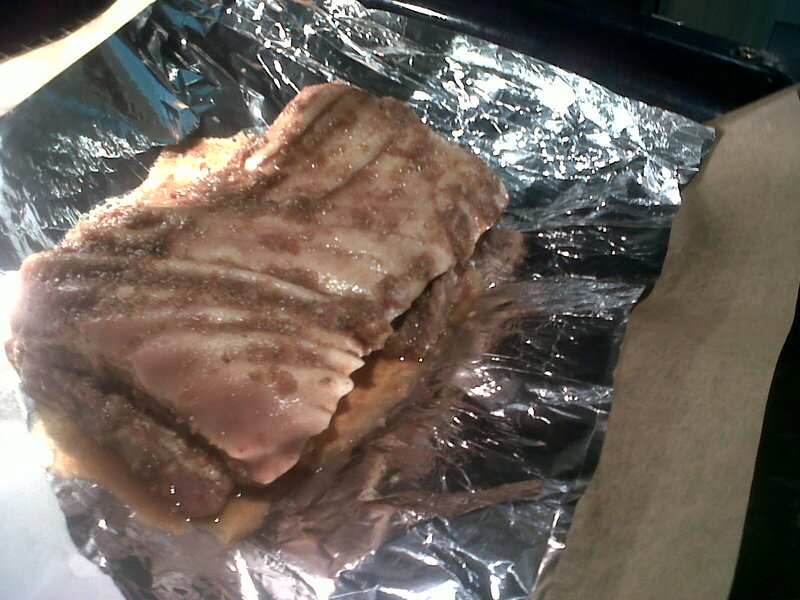 The pork, before it went in the oven. While the pork cooked in the oven I made a sauce, similar to the marinade, to pour over the pork when it was done. I made it a little fruity and not too spicy, as the pork was quite spicy. Blend all the ingredients in a food processor. 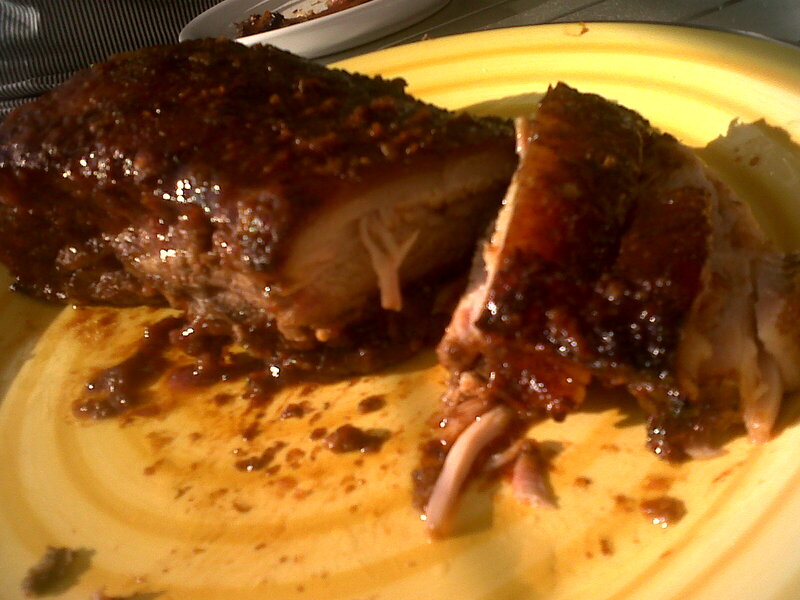 When ready, brush the pork with the sauce using a bunch of thyme and place on the barbeque. I didn’t do this, seeing as I don’t have a barbeque grill thingy, so I just put it back in the oven and set it to grill for about 15 minutes. The sauce should caramelise and colour. Remove and brush it with more sauce, leave to rest for 10 minutes before carving thick juicy pieces. Serve with some of the sauce on the side. Served it on the balcony, late afternoon, the sun was out, the girls kept me entertained with endless stories… I have to say it was the perfect Sunday afternoon! Mamamamamama WAIRIMU you need to make me a meal STAT!!! *begins stalkerish behaviours!! I like stalkers!! now it is up to you to tell me when i make you a meal… you know my digits! oh and thank you for visiting….